Sue Mifsud has been working with clay since 1993 and has a First Class BA (Hons) Degree in Ceramic Design from Glasgow School of Art. She has been the Technical Manager of Ceramika Maltija since 2010 and apart from seeing to the everyday running and administration of the pottery she is also involved in the designing/making process of Ceramika Maltija heritage work and teaches in-house classes. 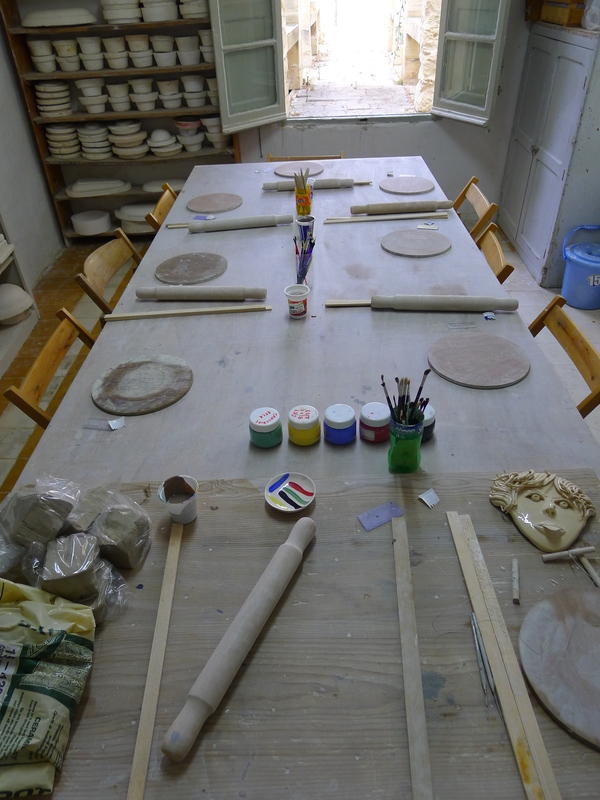 Sue works part time during the mornings, her afternoons are then spent working in her own Rabat studio creating contemporary ceramic functional ware and exhibition pieces. The temptation with our first pottery blog is to cram in everything that has happened during Ceramika Maltija’s 62 year existence, but taking into consideration that you, the reader, may have a life to enjoy, I will resist. So instead, what has happened and what is happening in the workshops will be fed to you a dose at a time on a weekly basis. Through our blog you will get to know more about the building, the events that we organise, the products that we produce and the customers that we serve. It wouldn’t be complete without you also getting to know the talented staff that make the pottery possible and who add a sprinkling of their very individual personalities to all that is made and happens. As this will be written from my viewpoint, a note should also be made that I sometimes see the world through squinted eyes with a tilted head so some of the more quirky happenings on the periphery of what we do will also make their way to you. This morning our Head Painter, Aldo Cremona handed me a postcard and it seems to be a perfect starting point for my online writings. The abridged version of our beginnings, which will be explored at a later date, would be that Ceramika Maltija pottery was started in 1952 in the grounds of Villa Bologna in what used to be the stables. In its heyday is used to employ over 30 people in a variety of roles; painters, modellers, mould makers, throwers etc. Every aspect of the making process was covered by skilled crafts men and women and through its history it employed the services of some of Malta’s most reputable ceramic artists such as Ganni Bonnici, Neville Ferry and Gabriel Caruana. 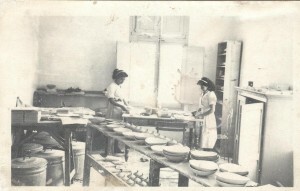 This image, we are guesstimating is from the late 50s early 60s and shows two very well dressed female employees glazing ceramic work. As you can see the shelves and tables are heaving with functional ware and it gives an indication of the high level of production during that period. The lidded bins under the table would have contained liquid glaze and with five bins in view there must have been at least five glaze colours available for use. There are also a stack of tiles on the table above the bins, these were a popular Ceramika Maltija item and would be screen printed with traditional Maltese characters and views. Lidded pots lined up in the centre of the picture were tea, coffee and sugar canisters obviously a very popular item at the time with twenty five of them waiting to be glazed. This is a very rich image and tells us not only a great deal about the pottery during this period but also about society and domestic life. Today this room is an extension of our slip casting area and in summer acts as our classroom. During July and August there is the buzz of young excited voices coming from this space and many wild and wicked creations are produced. I wonder for a moment how the two ladies in the photo would feel about the current use of their room, I’m sure they would approve knowing that so many others are offered the experience of working with clay. What they probably wouldn’t approve of is me teaching whilst wearing my scruffy work jeans and second hand t-shirts.